“Ah, Jeez, not Christy Moore, Jayz, we heard him loads of times before” as the man himself sang in Welcome to the Cabaret (on Live at The Point )and indeed, first scrutiny of this mammoth retrospective might suggest a similar response. Except, of course, Christy’s always been full of surprises and The Box Set has more than plenty, forming an aural companion to his innovative approach to autobiography, One Voice. So by no means can this be classed as a typical career retrospective, enhanced by 20x20 hindsight or a quasi-erudite and usually sycophantic essay on the artist concerned, titillating potential purchasers with the promise of previously unreleased material. 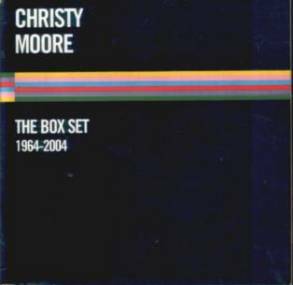 Instead this six-disc collection compiles 101 tracks (not counting several hidden ones) which, in Christy’s words are “taken from outtakes, b-sides and sleepless nights, from rehearsals, live takes, and deleted recordings” and represents “the under-belly” of the singer’s work since he was first recorded in a friend’s house singing The Bould Rake in 1964. And, being Christy, that “under-belly” is never soft! In other words, on one level this is a “warts and all” collection where Moore is more concerned about the strength of the song (in some cases supplying its full version as opposed to truncated commercial releases) and the magic of the occasion or the power of a performance rather than the quality of the recording. “Some sham taped it down the hall with a ghetto blaster under his arm and a microphone stuck up his arse,” he writes of his rendition of Viva La Quinte Brigada at Glasgow’s Barrowlands in 1991, adding “but I’m glad he took the trouble.” Nor is Christy frightened to reveal the changes in his voice over the years (from a nervous almost falsetto in his early days to the richness of his later times) or expose experimental performances, such as the resoundingly Thin Lizzy-like electric version of MacColl’s Tim Evans from the mid-1970s. Most significantly, however, The Box Set is of huge historical importance, documenting, as it does, many of the last few decades’ key political moments in Ireland’s history through songs such as Dunnes Stores (recounting the strike action taken by workers at the Dublin branch who refused to handle South African goods) or They Never Came Home, Moore’s own paean to the 48 young people who were killed by a fire at the Starlight Ballroom, Artane in 1981, or Veronica about the murder of journalist Veronica Guerin. Christy might wear his political heart on his sleeve, but there’s nothing sanctimonious or sentimental about these three examples of the many on display here. Classic versions of equally classic songs are abundant too – including The Lakes of Pontchartrain, Smoke and Strong Whiskey, The Raggle Taggle Gypsy and Little Musgrave – to satisfy the less politically minded. If there has to be a complaint, however, it must be regarding the method of organisation chosen by Moore and his collaborator Michael Traynor. The material is not presented chronologically, but in the form of six colour-coded discs (yellow, pink, blue, etc.). This might suggest some kind of thematic approach and, at first, it appears that this could be the case. The yellow album, for instance, contains some of the most overtly radical material, the pink one is dedicated more to traditional or traditionally-inspired songs, but such a theory begins to fall down when analysing the content of the other four discs. If there is some scheme, it remains, as yet, undetected or undisclosed. Lastly, the accompanying booklet contains Christy’s thoughts on each of the songs, often capturing a moment with humorous and sometimes barbed clarity – “Finsbury Park, 1971 – and a squat full of loopers” or, of his Paddy on the Road accompanists, “Never met the band before or since”. Others simply explain the background to a song or the atmosphere at a gig, but all remain an intrinsic part of a man who, sometimes against his will, has become regarded as one of Ireland’s national institutions, but should ultimately be esteemed as an international treasure. This is one hell of a collection with more high points than the Andes and nary a trough in sight. This review by Geoff Wallis was written for fRoots magazine – www.frootsmag.com.